Win Heal 2016 is the PUP that uses misleading techniques to prevent removal. Use Reimage to locate malicious components and get rid of them faster than with uninstall instructions. A full system scan blocks virus reappearance and prevents traffic to malicious domains. Why shouldn’t you trust Win Heal 2016? How can you stop this malware from entering your PC? What Win Heal 2016 removal options do I have? The worst thing about getting infected with potentially unwanted programs like Win Heal 2016 virus is the deceptive techniques they use to trick people into succumbing to the hackers’ evil plans. Even worse consequences may follow if you are dealing with such malware for the first time and have no idea about what you should or should not do. Consequently, the cyber criminals gain most profit from the inexperienced users. No need to panic. Even if your computer skills aren’t top-notch, you do not necessarily have to be among those unfortunate souls who get infected. You can avoid Win Heal 2016 malware by keeping yourself informed and learning how to recognize it. In this article, we will talk more about why it’s naive to trust such shady software and what can happen if you do. 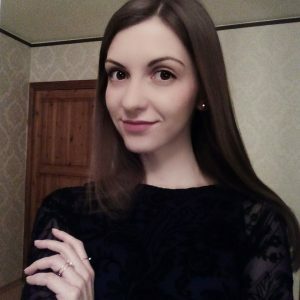 Also, at the end of the discussion, we will introduce virus protection techniques and provide you with a couple of useful tips how to remove Win Heal 2016 from the infected device. Win Heal 2016 is a tech support scam type of infection which, typically to the viruses of this category, gets into the computers without their owners’ permission. In fact, Win Heal 2016 can enter the system along with completely legitimate software, for instance, video/audio players, photo editors and such. Once it’s there, it starts generating pop-ups and various other forms of online advertisement with an intention to sell you unnecessary products or redirect you to some obscure sites to boost their traffic. But the most serious of these advertisements are those which claim that “Win Heal report shows that several security threats and stability issues are placing your PC at risk!”. Such messages additionally illustrate the concerning “statistics” of your computer’s current health situation and urge you to contact a tech support technician via provided telephone number (currently 1-866-207-6545) for an emergency assistance. Of course, it is all lies and tricks to get you into believing your system has been corrupted and to empty your bank account for the support service you don’t really need. The supposed system scan will be “initiated” automatically every time the PC is booted and connects to the network. Disconnecting the computer from the Internet is one of the first remedies that can stop the virus from generating fake advertisements. Once you’ve done that, the second step is Win Heal 2016 removal. It can be achieved by automatically scanning your PC with Reimage or other reputable antivirus utilities. Win Heal 2016 does not need any special conditions to infect your system. Essentially, it works like an adware, so it can spread the same way these viruses do — attached to some other, often popular, software. When agreeing to install this software, you are automatically agreeing with the malware installation as well. How can it be stopped then? How can you tell if the downloaded software package does not contain undesirable components? Well, firstly, you should always scan the downloaded files and installers with professional virus scanners. Do that before you start the installation process. When you are done, and no threats are detected, do not rush through the process either. Opt for the “Advanced” or “Custom” setup wizard modes which will help you decompose the downloaded software package and reveal what it really consists of. You will be able to cancel the installation of undesirable software, for instance, Win Heal 2016, via the same settings. 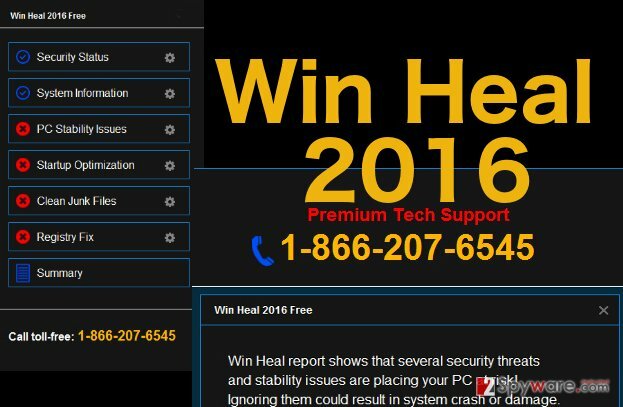 The Win Heal 2016 virus was built solely to satisfy its creators’ greedy needs. So it’s definitely no place for such a malicious program on your computer. You should remove Win Heal 2016 right away and if you have already paid for the fake tech support — inform your credit card company or the bank! Though for the virus elimination we recommend employing automatic tools, there is a possibility to eliminate the threat manually as well. Follow the Win Heal 2016 removal steps below to delete the parasite from your device and reset your browser. To remove Win Heal 2016 virus from your computer, you first have to find the executable virus file and terminate it. The file may be labeled WinHealWinHeal.exe, but there are no guarantees that the malware will not be hiding under some other title as well. Thus, we recommend going through the list of your recently installed programs and looking for software you do not recall installing on your computer yourself. You can always check whether the program is safe online or by contacting 2-spyware team. Here, look for Win Heal 2016 or any other recently installed suspicious programs. When in the new window, check Delete personal settings and select Reset again to complete Win Heal 2016 removal. Once these steps are finished, Win Heal 2016 should be removed from your Microsoft Edge browser. Here, select Win Heal 2016 and other questionable plugins. Click Remove to delete these entries. Now you will see Reset Firefox to its default state message with Reset Firefox button. Click this button for several times and complete Win Heal 2016 removal. Here, select Win Heal 2016 and other malicious plugins and select trash icon to delete these entries. Click Reset to confirm this action and complete Win Heal 2016 removal. This entry was posted on 2016-09-26 at 02:50 and is filed under Malware, Viruses. You can quickly scan the QR code with your mobile device and have Win Heal 2016 virus manual removal instructions right in your pocket. How did you remove Win Heal 2016 virus?